We were formed in 1979 to meet the needs of a growing number of horse people who wanted a type of riding other than in the show ring which could demonstrate good horsemanship and promote sound, sensible trail horses. We operate under the Manitoba Horse Council umbrella. Competitive Trail Rides are timed events, with a set time allowed to complete the course. Every ride may be different lengths of time, depending on terrain and weather conditions. Typically the pace is set between 5 to 7 miles per hour. Trails are well marked so that horses and riders can set whatever pace they wish, and mileage markers are posted at 5 and 10 miles, with a marker indicating 2 miles to camp. Horse and rider teams are scored on a demerit system for soundness, condition and manners, and the horse/rider team with the least demerits after final judging is declared the winner. Placings are awarded to the top 5, but all teams collect points towards year end awards. The areas the club chooses to ride are mostly wildlife areas with bare amenities. The club provides water for horses, but basically it is a camp-out situation, with riders supplying all of their own camping equipment, food and water. Anyone with a sound horse can participate in distance riding. Most of our members started out as pleasure riders, and many families have discovered this to be a sport that they can all participate in. If you enjoy riding in some of the most scenic country in Manitoba, come out and enjoy the marked trails and find out what competitive trail riding is all about. Membership is required to accumulate points towards year end awards. 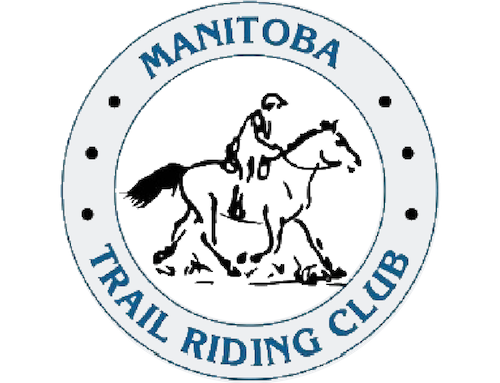 Although it is not necessary to have an MTRC membership to ride, it is mandatory to have a Manitoba Horse Council Membership. Please remember that if you have moved, or move during the ride season, please email, write or call to let us know your new address and phone number so that we can stay in touch with you. These may be paid by filling out an application and e-mailing or mailing to Mary Anne Kirk (address in the form), or by paying at a ride event.